This lovely pendant has a round diamond set at the top of the drop section in a mille-grained rubover platinum tube. The tube is attached by to an articulated platinum bar at the bottom of which are three oval fine blue aquamarines set in mille-grained rubover tube settings. 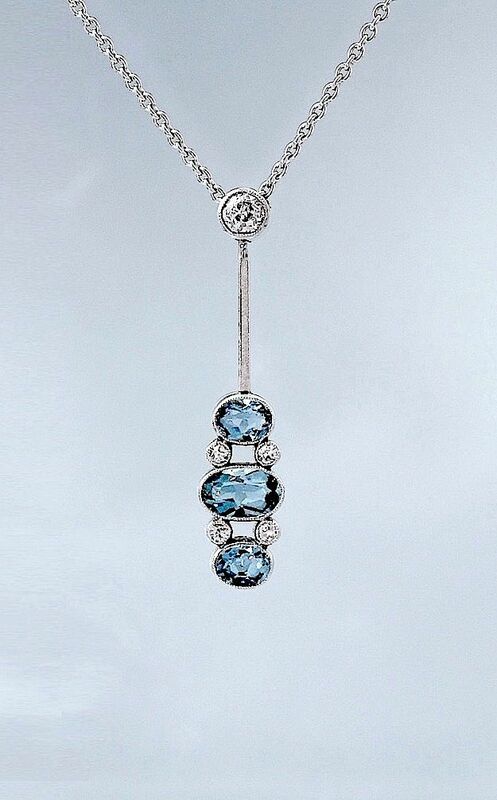 Between the top and middle aquamarine and between the middle and bottom aquamarine are two round diamonds each set in mille-grained rub over tube settings. There is an 18ct white gold chain that runs through the top of the tube setting.